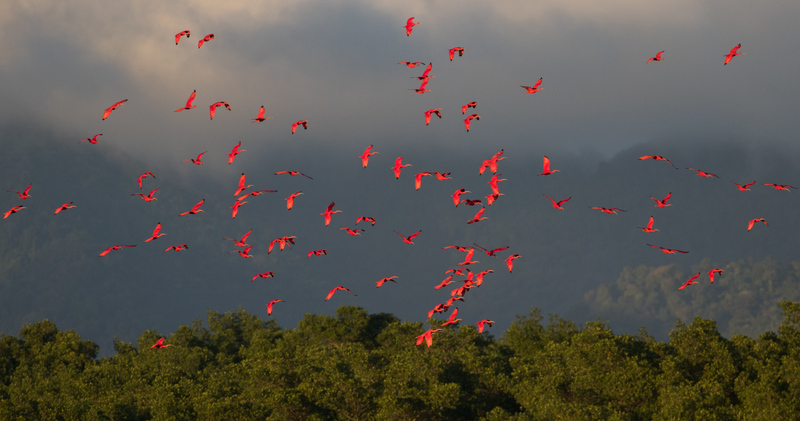 Scarlet Ibis roosts are one of the most iconic spectacles in the Neotropics, and this year we got to watch the overwhelming numbers arrive at the Caroni Swamp during an absolutely perfect sunset. Photo by guide Doug Gochfeld. This year’s holiday tour to the lovely dual island nation of Trinidad & Tobago was a splendid one. We birded in the sun, under cloud, amidst rain, and on the water, and had a blast every step of the way. Our base of operations for the bulk of the tour, while birding on Trinidad, was the incomparable Asa Wright Nature Center (AWNC). In between being alerted to the impending sunrise by the tooting of Ferruginous Pygmy-Owls, and sipping well-deserved Rum Punches at dusk, we enjoyed the extensive feeding operation chock full of hummingbirds (of ten species), honeycreepers, tanagers, thrushes, euphonias, and more when we weren’t in the field elsewhere on the island. Indeed, while AWNC may be the most well-known jewel in the crown of Trinidad’s ecotourism, there are many other gems scattered around the island. We explored the misty and ethereal high elevation forests of the Northern Range (the ultimate extension of the Andes), scoured the grassland savanna of the center of the island, and navigated the vast mangrove swamp at Caroni, with each location revealing more treasures than the last. Magical moments were frequent, with some memorable ones being the hike to Dunstan Cave for the prehistoric-looking (and sounding) Oilbirds, Bearded Bellbirds clanging overhead in the rainforest, intimate and in-your-face encounters with showy male Tufted Coquettes, the amazing night drive through Waller Field with Pauraque after Pauraque and displaying White-tailed Nightjars, and the captivating Scarlet Ibis spectacle in Caroni Swamp. Our time on Tobago was short but very, very, sweet. The forests of the Main Ridge, the oldest (legislatively-speaking) forest preserve in the Western Hemisphere, provided us with an array of new and exciting birds, including the very range-restricted White-tailed Sabrewing, great studies of a fantastic Gray-throated Leaftosser doing what its name implies, a ridiculously accommodating Rufous-tailed Jacamar, and several of the endemic Trinidad Motmots, which some think should be called Tobago Motmots given how much more readily seen they are there. We even had some time to relax at the picturesque Blue Waters Inn, where some swam in the warm waters of Batteaux Bay, and others took advantage of the pool. Our voyage to Little Tobago Island, with Batteaux Bay on one side and the open Atlantic Ocean to the east, was another great success. We scored a critically endangered Hawksbill Sea Turtle on the way out, and before we had landed on the island we had already seen Brown Boobies and Red-billed Tropicbirds on nests, while battalions of Red-footed Boobies cut through the air with grace and efficiency. A pleasant and wildlife-filled hike through the dry forest revealed Ocellated Gecko and Scaly-naped Pigeon, and took us to the scenic overlook. 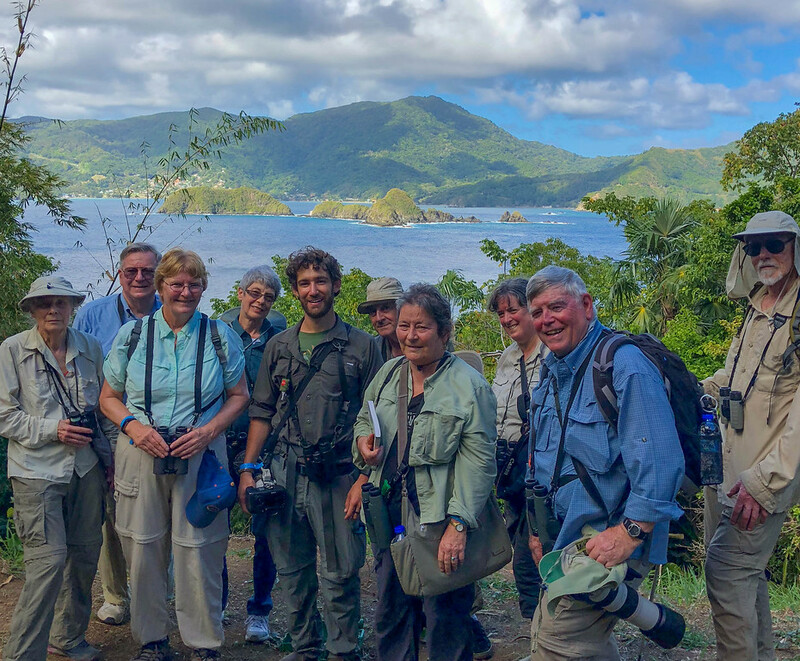 We were awed by the aerial acrobatics of Red-billed Tropicbirds and Magnificent Frigatebirds, and got to experience some true Attenborough moments. A big thanks to Caroline for ensuring such a smooth running tour, to David Ramlal, our local guide on Trinidad whose unrivaled experience in the wilds of that island showed through every day, to Jason Radix, our local guide on Tobago, who was a charismatic ambassador for the country and helped us find target after target, and of course Zolani “Z” Frank for his delightful interpretation of Little Tobago. From the bottom of my heart, I thank all of you for coming along and helping to make this tour such a pleasure. I hope to see you all in the field again soon! 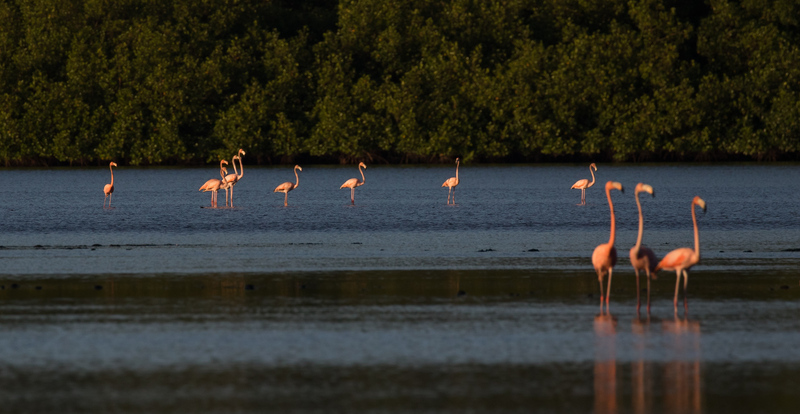 American Flamingo is a species that we aren't always lucky enough to encounter. There were dozens upon dozens spending time at the Caroni Swamp during this year's tour though! Photo by guide Doug Gochfeld. BLACK-BELLIED WHISTLING-DUCK (Dendrocygna autumnalis) – One was conveniently perched up atop a mound of dirt inside the Bon Accord sewage ponds during our visit there. BLUE-WINGED TEAL (Spatula discors) – Many on the flats in Caroni Swamp. RUFOUS-VENTED CHACHALACA (Ortalis ruficauda) – The Cocrico is Tobago's representative of the duo of national birds of Trinidad & Tobago, and we were entertained by their raucous calls and trusting antics all around Blue Waters Inn, including around (and in!) the dining area. AMERICAN FLAMINGO (Phoenicopterus ruber) – We had over sixty of these on our boat ride through the Caroni Swamp. It was a brilliant surprise which we don't get to experience on every tour. 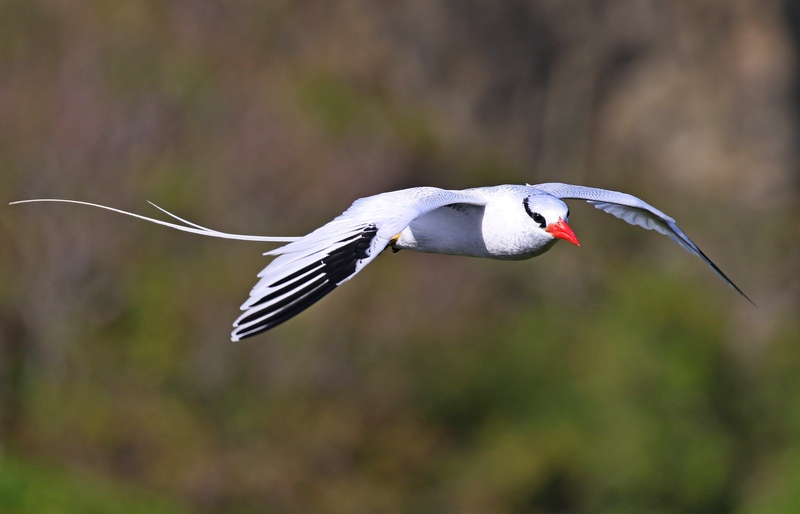 RED-BILLED TROPICBIRD (Phaethon aethereus) – One of the most graceful flyers on the planet. We were treated to a fantastic aerial show as they glided by us, and their close approaches as they attempted to land in nearby nests were especially heart-stopping (in a good way!). MAGNIFICENT FRIGATEBIRD (Fregata magnificens) – Another exceptionally graceful flyer, but much more vicious when it comes to its fellow tropical nesting birds. We got to watch a few exciting tail chases in which a frigatebird tried to chase down a tropicbird, and the agility shown by these huge, apparently gangly attackers was staggering. 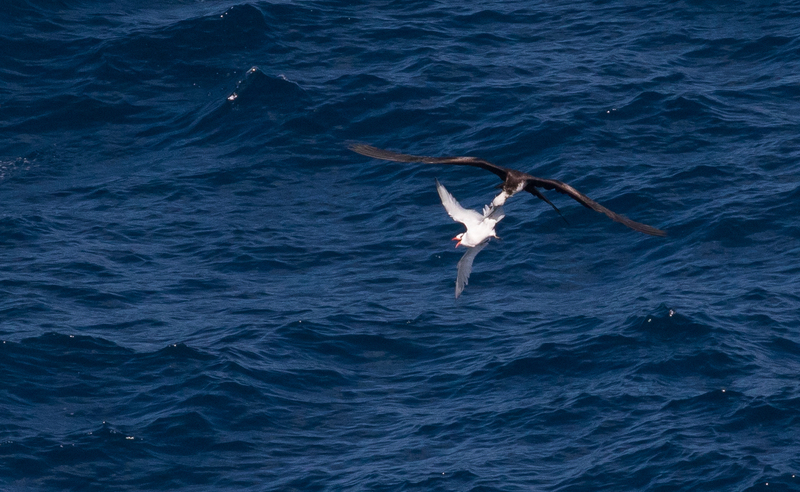 There was one stunningly brutal chase as well, where the chief frigatebird in charge of the chase (two others were less enthusiastically participating) grabbed the tropicbird by the body and tail and shook it all around to try and get some prey out of it! Nature is brutal and awesome all at once. BROWN BOOBY (Sula leucogaster) – Plenty around Little Tobago, and we even got fairly close to one of the nests on a low rock wall while we were still in the boat. RED-FOOTED BOOBY (Sula sula) – Great studies of both the light morph and the dark morph (adults complete with whitish tails) together on their nesting slopes. We even had one of each morph of Red-footed, and a Brown Booby all perched right next to each other for a really cool comparison. We also got to see a couple of very young and adolescent fluffy white boobies in some of the nests. The Red-billed Tropicbird show on Little Tobago Island is unparalleled, and we had a perfect morning during which to watch it. Photo by participant Ken Trease. NEOTROPIC CORMORANT (Phalacrocorax brasilianus) – Scattered around the west coast of Trinidad, including at Orange Valley, and Carli Bay. ANHINGA (Anhinga anhinga) – A couple around the Bon Accord Sewage Ponds. BROWN PELICAN (Pelecanus occidentalis) – Common along the coasts. GREAT BLUE HERON (Ardea herodias) – A couple on the flats at Orange Valley. GREAT EGRET (Ardea alba) – Scattered here and there in the lowlands, but not particularly common. LITTLE EGRET (WESTERN) (Egretta garzetta garzetta) – One of our many write-in surprises, this adult flew in just after we arrived at the bridge over the river at Trincity. It was then cooperative enough to fly back down the river and join a Snowy Egret, allowing us some very good comparative views to separate the two. SNOWY EGRET (Egretta thula) – Fairly common. LITTLE BLUE HERON (Egretta caerulea) – These were fairly common in wetlands throughout, and while they were outnumbered in total by the next species, Little Blues were the more widespread of the two. TRICOLORED HERON (Egretta tricolor) – Seen at a few places, including several hundred going to roost with the Scarlet Ibis at Caroni Swamp. CATTLE EGRET (Bubulcus ibis) – Scattered all around open areas of the lowlands- chasing tractors and mowers, and yes, even standing on cows. GREEN HERON (Butorides virescens) – The common Butorides on Tobago. Tobago Plantations was especially chock full of them. STRIATED HERON (Butorides striata) – Only a couple on Trinidad, with the best view being the one in the mangroves at Caroni Swamp. BLACK-CROWNED NIGHT-HERON (Nycticorax nycticorax) – Trincity were our first ones. YELLOW-CROWNED NIGHT-HERON (Nyctanassa violacea) – Low density along the west coast of Trinidad, and then again around the Magdalena Grand, including a very confiding one in the mangroves there. BOAT-BILLED HERON (SOUTHERN) (Cochlearius cochlearius cochlearius) – A fun bird, though firmly ensconced in a shroud of leaves that covered up much of its body. You could still see the head and that whopper of a bill though! This video montage of our tour brings back some of the highlights of our wonderful holiday expedition, from the Bearded Bellbirds ringing out through the forest to the Scarlet Ibis spectacle lighting up the swamp at dusk. Video by guide Doug Gochfeld. SCARLET IBIS (Eudocimus ruber) – For many, this was the distinct highlight of the trip, and with great reason. We watched as over 7,000 of these...neon, glowing, vibrant...there really isn't a word in the english language that adequately describes how vivid the pink was on these birds as they came into the marsh to roost in flocks of dozens and hundreds. This was a truly magical experience, and one that no amount of photos, video, or verbiage can truly do justice to. GLOSSY IBIS (Plegadis falcinellus) – A rarity on T&T, we had brief views of a continuing individual at the Bon Accord ponds. BLACK VULTURE (Coragyps atratus) – Abundant on Trinidad, especially in the lowlands. TURKEY VULTURE (Cathartes aura) – Abundant on Trinidad. OSPREY (Pandion haliaetus) – A couple scattered through our travels along the coast. ORNATE HAWK-EAGLE (Spizaetus ornatus) – We had a distant one of these distinctively shaped forest-dwelling raptors soaring to the east of AWNC over the Arima Valley at the end of our orientation walk around the grounds on our first full day. LONG-WINGED HARRIER (Circus buffoni) – Several locations in the lowlands on Trinidad. COMMON BLACK HAWK (Buteogallus anthracinus) – It did indeed live up to its name as being common (on Trinidad only), especially around Nariva and along the Blanchisseuse Road. SAVANNA HAWK (Buteogallus meridionalis) – Aripo and Nariva were the best spots for these long-legged raptors. GREAT BLACK HAWK (Buteogallus urubitinga) – A quick flyover of an adult while we were walking Gilpin Trace on Tobago. Luckily it called first, so we were all looking up in anticipation when it flew over an opening in the rainforest canopy. WHITE HAWK (Pseudastur albicollis) – Seen soaring around a couple of times at AWNC, including early on our first full day. GRAY-LINED HAWK (Buteo nitidus) – One perched in an awkward location in a tree along one of the creeks on the east side of the island. BROAD-WINGED HAWK (Buteo platypterus) – Several on Tobago, including one immature soaring over Little Tobago. SHORT-TAILED HAWK (Buteo brachyurus) – Light morphs were all that we saw, and they were fairly common, and very widespread, on Trinidad. Some truly excellent views to boot. ZONE-TAILED HAWK (Buteo albonotatus) – A few around the Arima Valley, one at Brasso Seco, and a couple in the lowlands as well. We got several Attenborough moments of our very own on Little Tobago, including this merciless attack on a Red-billed Tropicbird carried out by an immature Magnificent Frigatebird who was treating the tropicbird like a fish-filled piñata. Photo by guide Doug Gochfeld. PURPLE GALLINULE (Porphyrio martinica) – Great views at Tobago Plantations. COMMON GALLINULE (Gallinula galeata) – In several locations, including with newly hatched black fluffballs at the Tobago Plantations. BLACK-NECKED STILT (BLACK-NECKED) (Himantopus mexicanus mexicanus) – A few dozen were at the river in Trincity. BLACK-BELLIED PLOVER (Pluvialis squatarola) – A few of these bulky pluvialis at Orange Valley. AMERICAN GOLDEN-PLOVER (Pluvialis dominica) – A nice surprise was a juvenile in the drainage canal alongside the road near the Bon Accord Sewage Ponds. We got to study it at point blank range, and could even see a couple of bright golden-barred feathers starting to come in on the back. SOUTHERN LAPWING (Vanellus chilensis) – Common in a few places, including the river in Trincity and at Tobago Plantations. SEMIPALMATED PLOVER (Charadrius semipalmatus) – A few around Brickfield and Orange Valley. WATTLED JACANA (Jacana jacana) – Scattered widely in appropriate wetland habitat, and giving some very interesting calls reminiscent of large rail vocalizations at Tobago Plantations. The black-and-white downy young at the Tobago Plantations were especially pleasing to all. 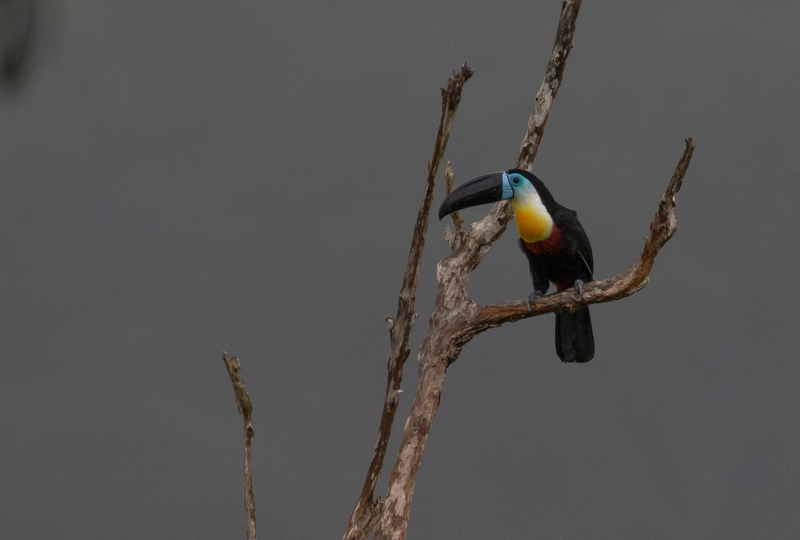 Channel-billed Toucan is the sole representative of the Ramphastidae in Trinidad & Tobago, but it shoulders that responsibility with the flair and beauty one would expect of a toucan. We had delightful experiences with them several times during our travels through the Northern Range. Photo by guide Doug Gochfeld. WHIMBREL (HUDSONIAN) (Numenius phaeopus hudsonicus) – A couple of these at Brickfield and Orange Valley. RUDDY TURNSTONE (Arenaria interpres) – We finally caught up with a few of these on the beach at Blue Waters Inn, though they weren't as bold as in past years, sticking to the beach rather than running around along the paths and through the dining room. RED KNOT (Calidris canutus) – A dozen or more of these mega long-distance migrants were on the mudflats at Orange Valley. STILT SANDPIPER (Calidris himantopus) – A nice flock of over 20 individuals in the river at Trincity! LEAST SANDPIPER (Calidris minutilla) – A couple with the shorebirds in Trincity. SEMIPALMATED SANDPIPER (Calidris pusilla) – A group roosting on the mudflats under the mangroves at Orange Valley. WESTERN SANDPIPER (Calidris mauri) – One very close bird at Brickfield, and then some more distant ones at Orange Valley. WILSON'S SNIPE (Gallinago delicata) – One flushed up at the ponds at Tobago Plantations and flew a circle in front of us before landing, allowing us to see the dark underwings and trailing edge characteristic of Wilson's. SPOTTED SANDPIPER (Actitis macularius) – Scattered around several locations, with the most impressive aggregation being in Caroni Swamp. SOLITARY SANDPIPER (Tringa solitaria) – A few scattered throughout, including at the Aripo Livestock Station and in Bon Accord. GREATER YELLOWLEGS (Tringa melanoleuca) – In several locations, including some side-by-side comparisons with their close congeners (Lesser Yellowlegs) providing for an impromptu shorebird identification workshop. WILLET (WESTERN) (Tringa semipalmata inornata) – The groups at Brickfield and Orange Valley were all of the large, lanky, gray, long-billed western subspecies (a subspecies for now, but a likely future split from Eastern Willet). LESSER YELLOWLEGS (Tringa flavipes) – Great comparisons with Greater Yellowlegs at multiple locations, including Bon Accord and Trincity. LAUGHING GULL (Leucophaeus atricilla) – A couple of dozen of these were at Orange Valley. LESSER BLACK-BACKED GULL (GRAELLSII) (Larus fuscus graellsii) – A single adult in close on the flats at Orange Valley. ROYAL TERN (Thalasseus maximus) – A couple flying offshore at the Magdalena Grand/Tobago Plantations. BLACK SKIMMER (CINERASCENS) (Rynchops niger cinerascens) – A couple dozen on the flats at Orange Valley. Copper-rumped Hummingbird is a mainstay throughout much of the tour. This one, gleaming coverts and all, at AWNC was photographed exceptionally well by participant Ken Trease. PALE-VENTED PIGEON (Patagioenas cayennensis) – Scattered around the lowland birding locations on both islands, and included some excellent scope views. SCALED PIGEON (Patagioenas speciosa) – We had spectacular scope views of this snazzy looking forest pigeon in excellent light during a break in the rain coming back up from Morne Le Croix. SCALY-NAPED PIGEON (Patagioenas squamosa) – It was its typical hard-to-get self on Little Tobago, but Z eventually located one perched in the distance from the lookout and we all got scope views, improving on our previous flight only experience. We were delighted by the myriad Green Honeycreepers at the feeders at AWNC. This molting youngster had made it most of the way from its bright green immature plumage to the vibrant turquoise of adults, but it still bore some tell-tale signs of its adolescence. Photo by participant Ken Trease. RUDDY GROUND-DOVE (Columbina talpacoti) – Common and widespread, mostly in the lowlands. WHITE-TIPPED DOVE (Leptotila verreauxi) – A couple around Tobago, along Gilpin Trace and on Little Tobago. GRAY-FRONTED DOVE (Leptotila rufaxilla) – After hearing it several times, a few of us finally got really great views of a singing bird in the bamboo along the entrance road at AWNC on the morning of our final full day there. EARED DOVE (Zenaida auriculata) – A couple of brief flybys at Caroni, but then very good views in the suburbs at various points around Tobago. GREATER ANI (Crotophaga major) – Whoa! What a cool bird and what great views. We finally connected with these after Lestor spotted a couple flying across the canal at Caroni, and they were still in the area when we approached, and came right out to the edge of the Mangroves. SMOOTH-BILLED ANI (Crotophaga ani) – Common in the lowlands of both islands. SQUIRREL CUCKOO (Piaya cayana) – Difficult this year, likely due to our rainy day up high (but only one even heard the rest of the time!). One showed well for me and Betsy right around the guard house just before our second-to-last breakfast at AWNC. BARN OWL (Tyto alba) – A last second flyover at the Trincity Mall as we were getting into our ride back to the hotel after our final dinner, and a long-awaited lifer for Betsy! FERRUGINOUS PYGMY-OWL (Glaucidium brasilianum) – Great views down by David's village in the Arima Valley. Heard every other day morning tooting very loudly from just off the veranda at AWNC as a wake up call for folks as well. 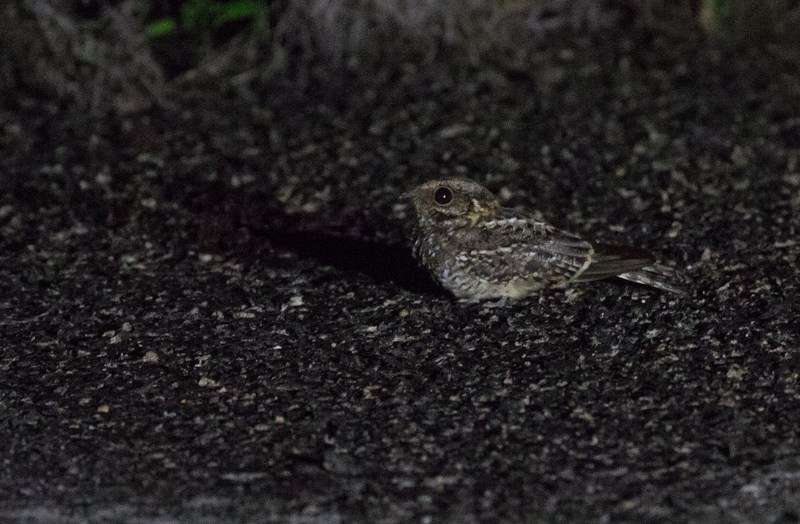 We had an incredible experience with White-tailed Nightjars during our night drive. The highlight was seeing and hearing their display flights at exceptionally close range, and then they perched on the ground multiple times to boot, allowing full frame scope views and photos. Photo by guide Doug Gochfeld. SHORT-TAILED NIGHTHAWK (Lurocalis semitorquatus) – Very nice flight studies of this distinctively-shaped nighthawk on our first evening at AWNC. COMMON PAURAQUE (Nyctidromus albicollis) – We were simply swimming in Pauraques during our night drive at Waller Field! WHITE-TAILED NIGHTJAR (Hydropsalis cayennensis) – A very cool experience with some displaying birds at Waller Field. Hearing them display in the dark at close range was such a fun and different experience that it contributed to the nightbirding outing making several folks' top 3 events of the trip! COMMON POTOO (Nyctibius griseus) – A neat one teed up on the margin of one of the runways at Waller Field. It gave good scope views that allowed us to see it's great googly yellow eyes and that good, upright posture. OILBIRD (Steatornis caripensis) – One of the stars of the show, and one of the most well known species that inhabits Trinidad. Our hike through the rain and down the sloppily wet trail to Dunstan Cave was more than worthwhile. Our views of them in the gorge (it's really a gorge, not a cave) included evocative silhouettes on cliff edges, bright eyeshine in the deep darkness, birds fluttering (though I'm not sure is the best to describe their flight) around in the shadows, and some really good point blank looks at some which were inhabiting ledges closer to the mouth of the gorge. The eerie vocalizations only added to the magical experience. CHESTNUT-COLLARED SWIFT (Streptoprocne rutila) – A couple were flying around with the really low mixed-species flock of swifts on our first morning heading down the Arima Valley. SHORT-TAILED SWIFT (Chaetura brachyura) – Common in the lowlands, with an especially large group over the Bon Accord sewage ponds on Tobago. BAND-RUMPED SWIFT (Chaetura spinicaudus) – Small numbers sprinkled into the larger numbers of Gray-rumped Swifts during our travels around the Northern Range. GRAY-RUMPED SWIFT (Chaetura cinereiventris) – The common Chaetura swift at high elevations on both islands. LESSER SWALLOW-TAILED SWIFT (Panyptila cayennensis cayennensis) – I initially conjectured that this low-flying swift flashing white around the head amidst the big flock of swifts on our first day heading down the Arima Valley was a White-collared Swift. However, the extensive white on the throat, clearly visible from underneath (and in photos), as well as the distinctive thin tail, showed the bird to be this species, which is a low density resident in the Northern Range. A good cautionary tale to remind one to always look at a bird in binoculars if possible! 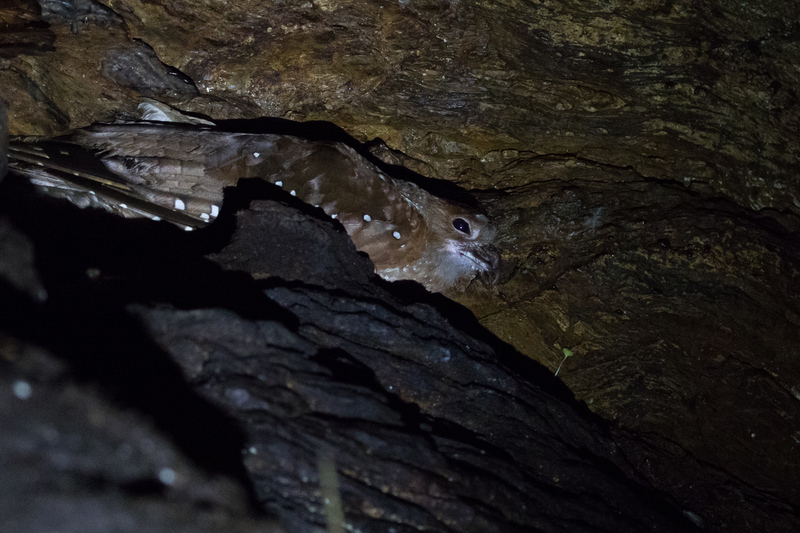 Oilbird is yet another iconic bird of Trinidad, and we had some great up close views this year. Photo by guide Doug Gochfeld. WHITE-NECKED JACOBIN (Florisuga mellivora) – What a flashy bird. They were abundant at the feeders at AWNC and even in the forest of the Main Ridge on Tobago. It's always nice for the most common species in a family to be such a gaudy one! RUFOUS-BREASTED HERMIT (Glaucis hirsutus) – Some nice views here and there, mostly right around AWNC. GREEN HERMIT (Phaethornis guy) – The commonest hermit around AWNC, where it visits the feeders much more frequently than the other two species of hermits that are found in Trinidad. It was also seen around various heliconias and the African Torch Ginger flowers along the AWNC trails. LITTLE HERMIT (Phaethornis longuemareus) – The scarcest of the three Trinidadian hermits here, we had brief views in the lowlands (at the Cacique colony), and along the Blanchisseuse Road. Some folks also had it around the cabins and driveway at AWNC. BROWN VIOLETEAR (Colibri delphinae) – A nice treat was this very low density species attending the feeders at AWNC daily during our stay. 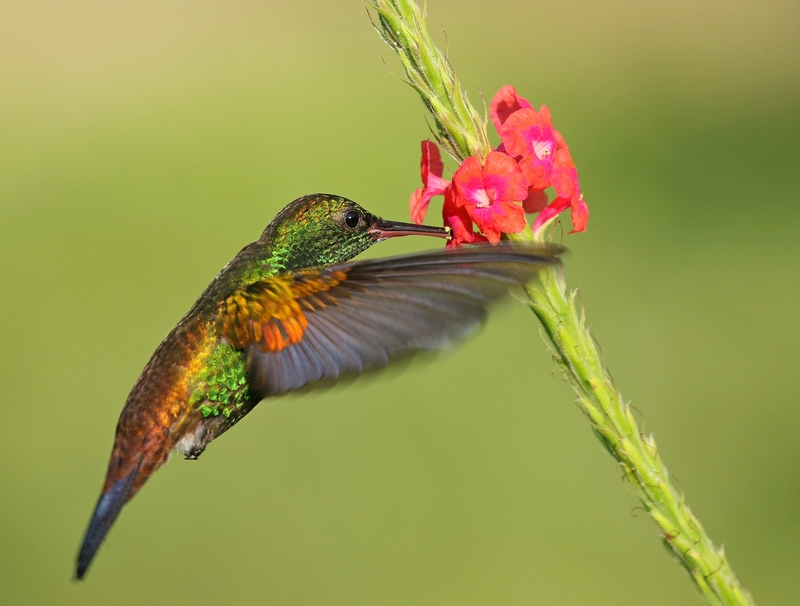 RUBY-TOPAZ HUMMINGBIRD (Chrysolampis mosquitus) – This brilliant hummer is always high on the hummingbird want list in Trinidad. They proved flighty and difficult during our time at AWNC, apparently showing up at the flowers at odd hours in the middle of the day while we were afield. Fortunately, they are much easier to see in the field in Tobago, and we got some stellar views on our first day, at both Bon Accord and Tobago Plantations. GREEN-THROATED MANGO (Anthracothorax viridigula) – A pair of these lowland/mangrove specialists were perched up in some bare branches during our Caroni boat ride. BLACK-THROATED MANGO (Anthracothorax nigricollis) – Common around AWNC, and also seen in several other locations. 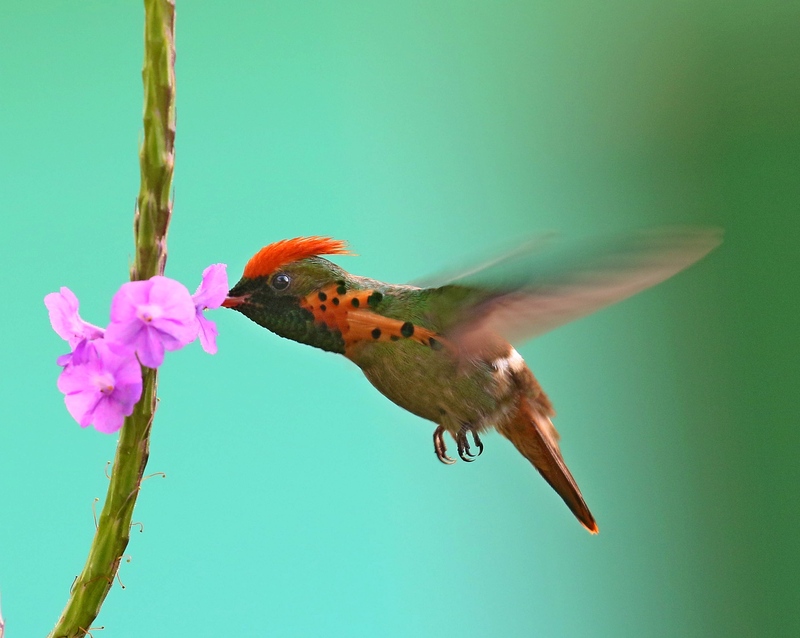 TUFTED COQUETTE (Lophornis ornatus) – SHOWSTOPPER! These males are ridiculous looking animals, with what could be considered a gratuitous amount of good looks. We should all applaud whatever selection process was responsible for this miniature wind-up toy of awesomeness. LONG-BILLED STARTHROAT (Heliomaster longirostris) – A scarcity in the Northern Range, but we saw at least one male visiting the AWNC feeders on several occasions. BLUE-CHINNED SAPPHIRE (Chlorestes notata) – Some good looks at this little gem around AWNC, and then again at Nariva Swamp of all places. WHITE-TAILED SABREWING (Campylopterus ensipennis) – One of our primary targets on the Main Ridge of Tobago, we went window-shopping for these along the roadside there, before immersing ourselves in their natural rainforest habitat along the Gilpin Trace, where we got to see them foraging for insects and bickering with White-necked Jacobins. WHITE-CHESTED EMERALD (Amazilia brevirostris) – Very common around AWNC. COPPER-RUMPED HUMMINGBIRD (Amazilia tobaci) – Fairly common around AWNC, and one of the few hummingbird species that is common on both islands. Tufted Coquettes are among the most desired of any of the birds of Trinidad, and it's easy to see why! This year we had repeated wonderful experiences with them at AWNC as they fed at extremely close range while seemingly taking no heed of our presence. Photo by participant Ken Trease. GUIANAN TROGON (Trogon violaceus) – We ended up having excellent luck with this species, seeing it very well in the sun and in the rain, and through scope, binoculars, and camera viewfinders. Some really confiding individuals. COLLARED TROGON (Trogon collaris) – We heard it on our first day on the Discovery Trail, and then those than came on our pre-breakfast walk on our final full day in Trinidad got to see one munching on a caterpillar at very close range, all the while giving its interesting trilling call. We ended the tour the way we began it: smiling. With a fantastic show of tropicbirds, boobies, and frigatebirds on Little Tobago, all against the scenic backdrop of Batteaux Bay and lovely Speyside, one couldn't expect anything different! Photo by guide Doug Gochfeld. RINGED KINGFISHER (Megaceryle torquata) – Good views at the Millennium in Trincity. BELTED KINGFISHER (Megaceryle alcyon) – Heard at the Magdalena Grand and seen from the boat at Little Tobago. GREEN KINGFISHER (Chloroceryle americana) – A fidgety pair at our antbird stop in the mangroves along the road to Nariva. AMERICAN PYGMY KINGFISHER (Chloroceryle aenea) – Good views for some on the way to Nariva, and good views for all from the boat at Caroni. 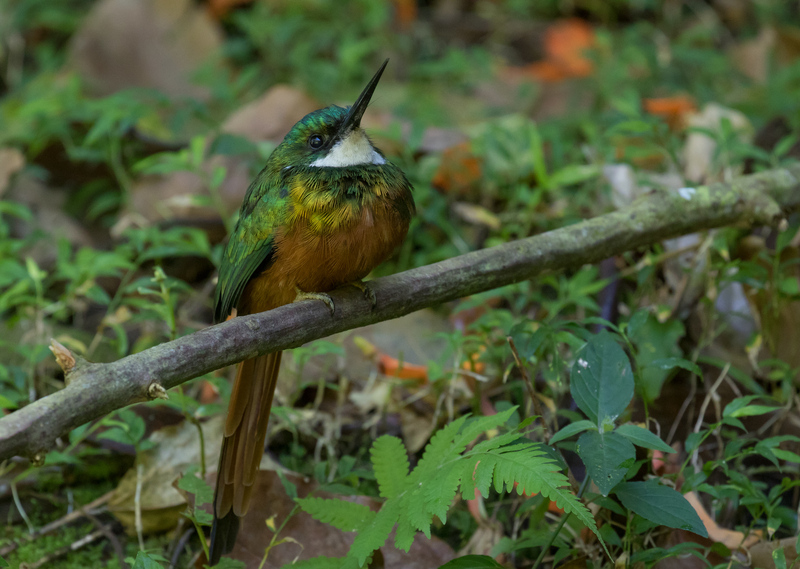 RUFOUS-TAILED JACAMAR (Galbula ruficauda) – A couple of very obliging individuals along the Gilpin Trace were dandy treats. CHANNEL-BILLED TOUCAN (Ramphastos vitellinus) – We saw Trinidad's version of Toucan Sam on several occasions, and each and every time that gorgeous plumage and goofy bill brought grins and laughter to our faces. RED-CROWNED WOODPECKER (Melanerpes rubricapillus) – Fairly widespread in Tobago, in both the lowlands and the highlands. We actually saw several of them feeding on flame tree flowers in one particularly active feeding frenzy around a couple of trees. RED-RUMPED WOODPECKER (Veniliornis kirkii) – We heard it very well, and most folks saw it as it trickily flew back and forth between various dark, shaded areas along the Gilpin Trace on Tobago. GOLDEN-OLIVE WOODPECKER (Colaptes rubiginosus) – Common in the rainforest of both islands, but still a joy to see each time. It was one of the very first birds we looked at in the scope as a group, and the gasps that followed each person's first views were telling. LINEATED WOODPECKER (Dryocopus lineatus) – Nariva Swamp, Carli Bay, and the Arima Valley for these large and charismatic woodpeckers. CRIMSON-CRESTED WOODPECKER (Campephilus melanoleucos) – A stonking male perched up in good view at Morne Le Croix, though only briefly. Rufous-tailed Jacamars showed very well on both islands, but none better than this absurdly confiding individual along the Gilpin Trace. Photo by guide Doug Gochfeld. CRESTED CARACARA (Caracara cheriway) – We had one bickering with a young Common Black-Hawk along the entrance road to Nariva Swamp- a cool experience indeed. YELLOW-HEADED CARACARA (Milvago chimachima) – Common and widespread in the lowlands of both islands. BAT FALCON (Falco rufigularis) – A couple of these whizzing by at Morne Le Croix were an exciting punctuation to an already hopping stop! BLUE-HEADED PARROT (Pionus menstruus) – Excellent views of these multiple times during our day along the Blanchisseuse Road. What stunning psittacids! YELLOW-CROWNED PARROT (Amazona ochrocephala) – A few of these were at Nariva, where we got reasonable scope views. ORANGE-WINGED PARROT (Amazona amazonica) – Abundant on both islands, and often the first diurnal bird sound heard each morning at AWNC. GREEN-RUMPED PARROTLET (Forpus passerinus) – Good experiences with these at a couple of locations around Trinidad. 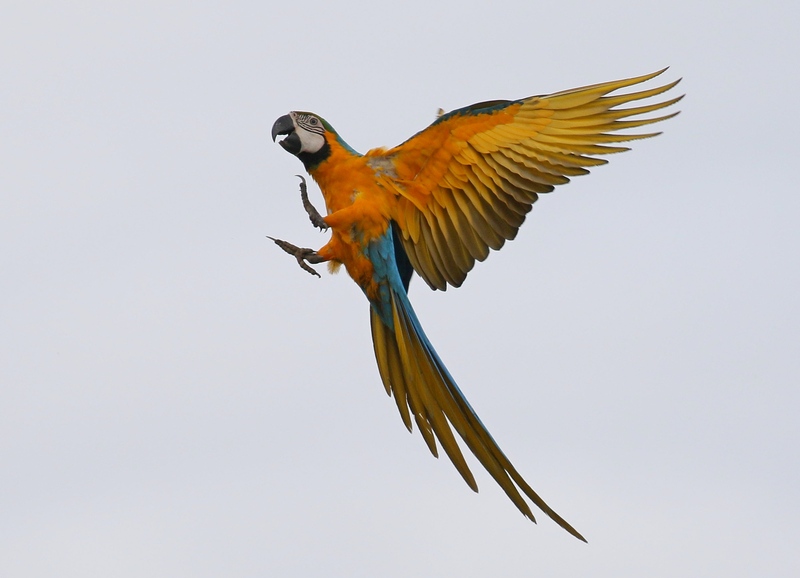 BLUE-AND-YELLOW MACAW (Ara ararauna) – A magical experience with a troop of around 8 of these, gregarious, charismatic, and larger-than-life birds! They were almost extirpated from Trinidad due to the cage bird trade, but with the help of a reintroduction program, they have been making a comeback. Blue-and-Yellow Macaw is a species that was virtually extirpated from Trinidad, due to trapping pressure brought on by the pet trade. Recent conservation efforts have been proving successful, and the population is now increasing, allowing for better and better chances to encounter them. This one was well and truly immortalized by participant Ken Trease. GREAT ANTSHRIKE (Taraba major) – We saved it until our last full day on Trinidad, but oh man did we get them! A great pair alongside the road in the Arima Valley was an excellent way to begin our Caroni Swamp day. BLACK-CRESTED ANTSHRIKE (Sakesphorus canadensis) – Arena Forest and Caroni Swamp produced these good lookers. BARRED ANTSHRIKE (Thamnophilus doliatus) – These charismatic antshrikes were common right around the buildings at AWNC, and one of the most commonly asked about vocalizations because its sound is so conspicuous. We also got stellar views in the mangroves on Tobago. A great bird. PLAIN ANTVIREO (Dysithamnus mentalis) – These often difficult ones appeared in front of us not once, but twice, along the Gilpin Trace on Tobago! WHITE-FLANKED ANTWREN (Myrmotherula axillaris) – Seen well on Trinidad. WHITE-FRINGED ANTWREN (Formicivora grisea) – Seen very well on Tobago. 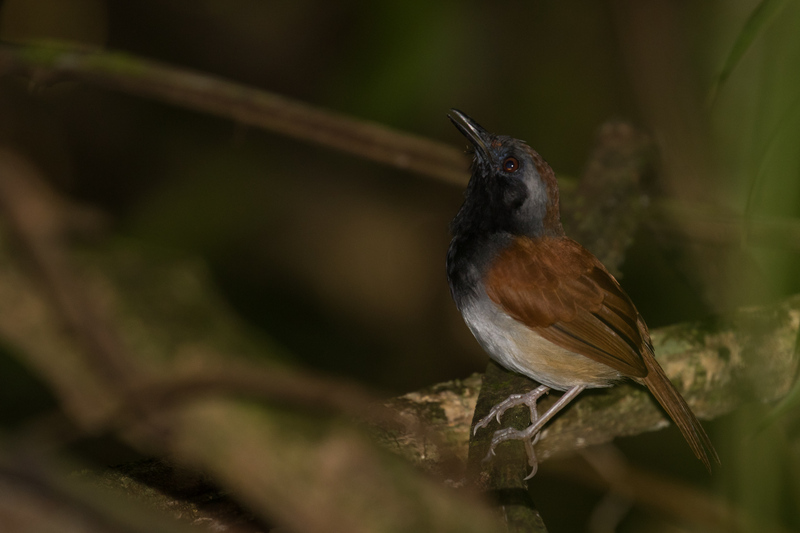 SILVERED ANTBIRD (Sclateria naevia) – Views of a pair of these skulking antbirds in the mangroves on the way to Nariva. WHITE-BELLIED ANTBIRD (Myrmeciza longipes) – A truly spectacular experience with a very confiding and territorial one along the trails at AWNC, and then we had another one perching on handrails along another nearby trail just a short while later. It was fabulous to see so well a species which can be so difficult to lay eyes on. White-bellied Antbird put on an incredible show for us on our first full day at AWNC. Photo by guide Doug Gochfeld. GRAY-THROATED LEAFTOSSER (Sclerurus albigularis) – Another very special experience in a tour filled with them. We had gotten fleeting glimpses of a female near a known active nest hole (which we didn't stick around near so as not to disturb the process), which we thought were going to have to suffice. Then, on our way out, we heard it somewhat nearby the nest, and we ended up finding it foraging in the leaf-litter on a nearby slope, and we all eventually got great views of it as it did indeed toss leaves as it hopped around looking for tasty morsels for its waiting chicks. OLIVACEOUS WOODCREEPER (Sittasomus griseicapillus) – Great views of a very cooperative and inquisitive individual along the lower part of Gilpin Trace. PLAIN-BROWN WOODCREEPER (Dendrocincla fuliginosa) – Brief views for at least Ann, Betsy, and Miles at AWNC. COCOA WOODCREEPER (Xiphorhynchus susurrans) – A few of these scattered around AWNC. STRAIGHT-BILLED WOODCREEPER (Dendroplex picus) – We finally got eyeballs on these (after hearing several prior) in the eleventh hour on our Caroni boat ride, at what we had already stated would be our last attempt for the species. We ended up getting stellar views below eye level at point blank range! STREAK-HEADED WOODCREEPER (Lepidocolaptes souleyetii) – Great views of an exceptionally and immediately responsive pair at Orange Valley. STREAKED XENOPS (Xenops rutilans) – Arena Forest and the Arima Valley. YELLOW-CHINNED SPINETAIL (Certhiaxis cinnamomeus) – Cooperative at the Aripo Agricultural Station. PALE-BREASTED SPINETAIL (Synallaxis albescens) – Nice views on the way to Morne Le Croix. STRIPE-BREASTED SPINETAIL (Synallaxis cinnamomea) – A very spunky and confiding pair along the Gilpin Trace were a good treat. SOUTHERN BEARDLESS-TYRANNULET (Camptostoma obsoletum) – Several times on Trinidad. FOREST ELAENIA (Myiopagis gaimardii) – Arena Forest and Arima Valley. YELLOW-BELLIED ELAENIA (Elaenia flavogaster) – Several times in the lowlands. OLIVE-STRIPED FLYCATCHER (Mionectes olivaceus) – A really nice pickup were four of these scarce high elevation specialists feeding in a trema tree near the ridge along the Blanchisseuse Road on our rainy outing there. OCHRE-BELLIED FLYCATCHER (Mionectes oleagineus) – Several observations across both islands. YELLOW-OLIVE FLYCATCHER (Tolmomyias sulphurescens) – Our final morning in the Arima Valley. YELLOW-BREASTED FLYCATCHER (Tolmomyias flaviventris) – Seen in quite a few places, we all agreed that the old name of "Ochre-lored Flatbill" was a better descriptor of this distinctive and widespread species. 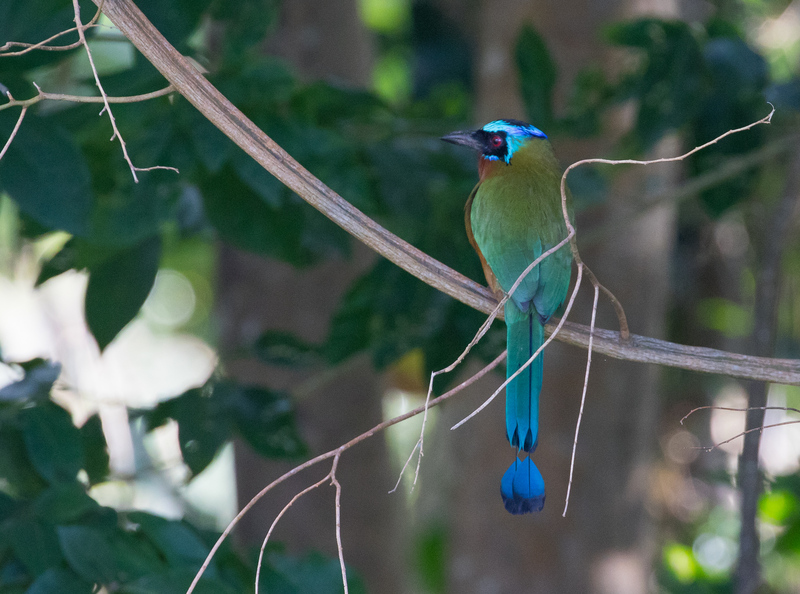 The Trinidadian endemic Trinidad Motmot was extra obliging on Tobago. Photo by guide Doug Gochfeld. BRAN-COLORED FLYCATCHER (Myiophobus fasciatus) – A nice surprise at David's Masked Yellowthroat spot, and it gave great views! EULER'S FLYCATCHER (Lathrotriccus euleri) – This one gave great views to those who came along on the sunrise walk on our final full morning at AWNC. TROPICAL PEWEE (Contopus cinereus) – Seen in several spots on Trinidad. FUSCOUS FLYCATCHER (Cnemotriccus fuscatus) – Good views for most towards the end of our hike at the Gilpin Trace. PIED WATER-TYRANT (Fluvicola pica) – Best views were at Nariva. WHITE-HEADED MARSH TYRANT (Arundinicola leucocephala) – Aripo Livestock Station held our first and best views of these tiny denizens of wetlands. VENEZUELAN FLYCATCHER (Myiarchus venezuelensis) – Great views of and listens to several of these on Tobago's Main Ridge. BROWN-CRESTED FLYCATCHER (Myiarchus tyrannulus) – Brief views around Caroni Swamp, but then quite common on Tobago. GREAT KISKADEE (Pitangus sulphuratus) – Common and conspicuous, as is typical in the tropics. BOAT-BILLED FLYCATCHER (Megarynchus pitangua) – Nice views of several of these through our travels in Trinidad, including at AWNC and at the Arena Forest. STREAKED FLYCATCHER (Myiodynastes maculatus) – A couple on our final Arima Valley morning were nice bonuses at the Great Antshrike stop. SULPHURY FLYCATCHER (Tyrannopsis sulphurea) – These lowland savanna specialists were on site as expected during our evening visit to Waller Field. TROPICAL KINGBIRD (Tyrannus melancholicus) – So common. GRAY KINGBIRD (Tyrannus dominicensis) – A couple on Trinidad, and more on Tobago. BEARDED BELLBIRD (Procnias averano) – Truly one of the best birds there is, and a huge draw for Trinidad's Northern Range. We got excellent views of males on multiple occasions, as they clanged out their obscenely loud anvil-like calls over and through the Arima Valley. Simply awesome. BLUE-BACKED MANAKIN (Chiroxiphia pareola) – The manakin on Tobago, where we saw adult males, females, and at least one young male that looked like a combination of the two! WHITE-BEARDED MANAKIN (Manacus manacus) – Excellent views around the Arima Valley. GOLDEN-HEADED MANAKIN (Ceratopipra erythrocephala) – Seen several times around AWNC and along the Blanchisseuse Rd. Some of us took the rare opportunity to go look at a small Fer-de-Lance curled up off the trail at AWNC on our first afternoon there. Just look at those scales! Photo by guide Doug Gochfeld. RUFOUS-BROWED PEPPERSHRIKE (NORTHERN) (Cyclarhis gujanensis flavipectus) – The Aripo Savanna provided our best views of this easier to hear than see species. SCRUB GREENLET (TOBAGO) (Hylophilus flavipes insularis) – The Tobago Greenlet, as it may become after a split that would make it a Tobago endemic, showed very well for us at Bon Accord, and then throughout our couple of days of birding Tobago. GOLDEN-FRONTED GREENLET (Pachysylvia aurantiifrons saturata) – Common in the canopy of the Northern Range on Trinidad. SOUTHERN ROUGH-WINGED SWALLOW (Stelgidopteryx ruficollis) – Widespread on Trinidad. CARIBBEAN MARTIN (Progne dominicensis) – We lucked into a small group of three of these flying over Tobago Plantations. GRAY-BREASTED MARTIN (Progne chalybea) – Abundant in the lowlands of Trinidad, and even present in some open areas slightly higher up. WHITE-WINGED SWALLOW (Tachycineta albiventer) – Common on both islands, mostly in the lowlands. BARN SWALLOW (Hirundo rustica) – At least 15 individuals over the Bon Accord sewage ponds. HOUSE WREN (Troglodytes aedon) – Every full birding day of the tour. Different taxa on each island (clarus and tobagensis), but not particularly noticeably different. RUFOUS-BREASTED WREN (Pheugopedius rutilus rutilus) – The Trinidad version of this species showed very well in multiple locations through a wide range of elevation (including AWNC and Arena Forest). RUFOUS-BREASTED WREN (Pheugopedius rutilus tobagensis) – Excellent experience with a pair along the Gilpin Trace. LONG-BILLED GNATWREN (Ramphocaenus melanurus) – Good views multiple times on Trinidad. YELLOW-LEGGED THRUSH (Turdus flavipes xanthoscelus) – Excellent views of a male along Gilpin Trace. COCOA THRUSH (Turdus fumigatus) – Present on Trinidad only, but quite common there. SPECTACLED THRUSH (Turdus nudigenis) – Common on both islands, and a frequent sight at the AWNC feeders. 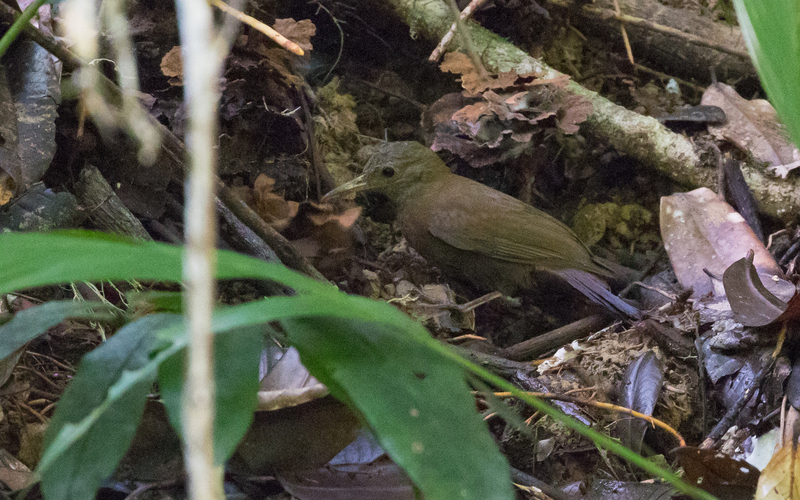 WHITE-NECKED THRUSH (GRAY-FLANKED) (Turdus albicollis phaeopygoides) – Seen well on both islands, though tends to be the lowest density (aside from Yellow-legged) of the thrushes we encounter. TROPICAL MOCKINGBIRD (Mimus gilvus) – Every.Single.Day. After being rained out of our best chance to see Gray-throated Leaftosser on Trinidad, we ended up with excellent views of this adult female doing its leaf-tossing thing on Tobago, where the species is a scarce resident. NORTHERN WATERTHRUSH (Parkesia noveboracensis) – Common in appropriate habitat on both islands, especially in the mangroves. PROTHONOTARY WARBLER (Protonotaria citrea) – A nice write-in surprise in the mangroves at Orange Valley in Trinidad and then a couple in the mangroves at Bon Accord on Tobago. MASKED YELLOWTHROAT (MASKED) (Geothlypis aequinoctialis aequinoctialis) – A nice male adjacent to a neighborhood in the Arima Valley. AMERICAN REDSTART (Setophaga ruticilla) – Seen several times. TROPICAL PARULA (Setophaga pitiayumi) – Good views in the Arima Valley and at the Arena Forest. YELLOW WARBLER (Setophaga petechia) – Fairly common in the lowlands. MASKED CARDINAL (Paroaria nigrogenis) – A great last second save at Caroni Swamp- we actually waited until we were in the boat to see one, but when we finally did encounter one it was a fantastic male that posed well for us. WHITE-SHOULDERED TANAGER (Tachyphonus luctuosus flaviventris) – One of the lowest density tanagers on Trinidad, we encountered them three different times around the Northern Range- more than usual! WHITE-LINED TANAGER (Tachyphonus rufus) – Abundant on both islands. SILVER-BEAKED TANAGER (Ramphocelus carbo magnirostris) – Very common on Trinidad. 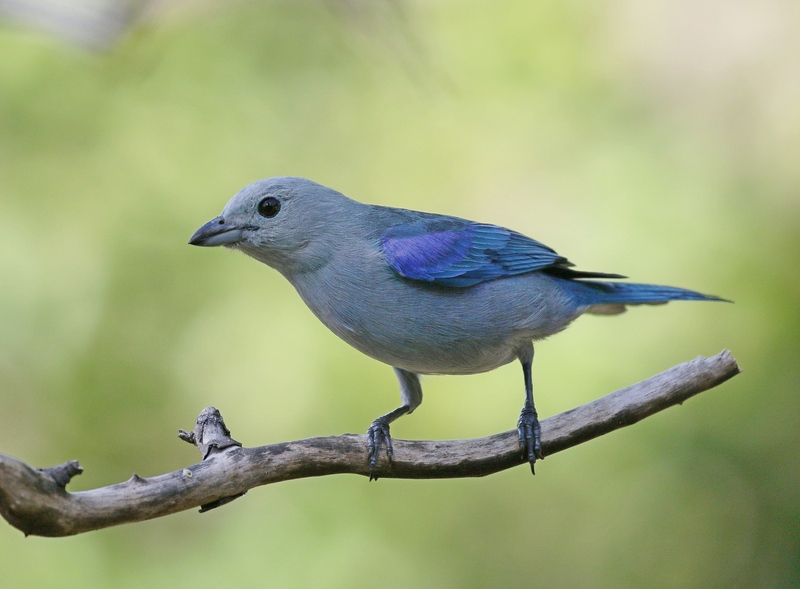 BLUE-GRAY TANAGER (BLUE-GRAY) (Thraupis episcopus nesophila) – The subspecies on Trinidad, where it is a daily sight. BLUE-GRAY TANAGER (BLUE-GRAY) (Thraupis episcopus berlepschi) – The deeper blue-colored subspecies, we found these to be very common on Tobago. PALM TANAGER (Thraupis palmarum) – Abundant on both islands. SPECKLED TANAGER (Ixothraupis guttata) – Good views on two occasions on our day in the higher reaches of the Northern Range. TURQUOISE TANAGER (Tangara mexicana) – Nice views along the Blanchisseuse Road. BAY-HEADED TANAGER (Tangara gyrola) – Very excellent views of this striking tanager on multiple occasions, including at AWNC. Blue-gray Tanager was omnipresent in some locations (especially on Tobago), but its subtle beauty and many different shades of blue never got old to look at. Photo by participant Ken Trease. BLUE DACNIS (Dacnis cayana) – A few in flocks of birds feeding on flame trees in various locations around Trinidad, including the Blanchisseuse Road and the Arena Forest. PURPLE HONEYCREEPER (Cyanerpes caeruleus) – Abundant in the rainforest of Trinidad, especially at the AWNC feeders. RED-LEGGED HONEYCREEPER (Cyanerpes cyaneus) – A couple of brief views in Trinidad did not offer joy for most folks, but then we did finally connect for fairly good views of birds feeding in flowering flame trees on Tobago. 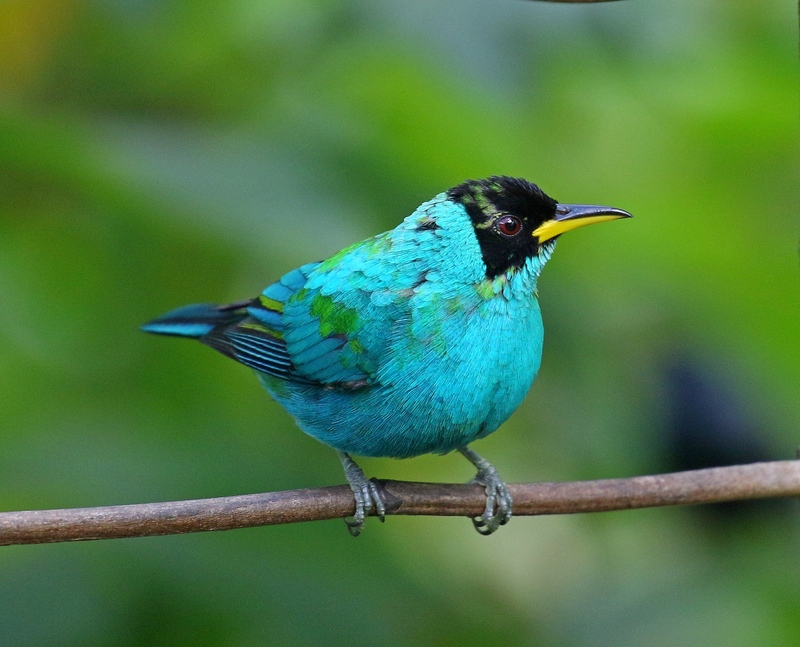 GREEN HONEYCREEPER (Chlorophanes spiza) – Abundant in the rainforest of Trinidad, especially at the AWNC feeders. BICOLORED CONEBILL (Conirostrum bicolor) – Excellent views in the mangroves at Orange Valley, and a bunch heard during the boat ride at Caroni. SAFFRON FINCH (Sicalis flaveola) – Great views at the Trincity Millennium and then a few around Carli Bay. GRASSLAND YELLOW-FINCH (Sicalis luteola) – Good views at the Aripo Livestock Station. BLUE-BLACK GRASSQUIT (Volatinia jacarina) – Fairly common and widespread in appropriate habitat, which is mostly in the lowlands, though we saw some fairly high as well. BANANAQUIT (Coereba flaveola) – The Bananas definitely don't quit in T&T. SOOTY GRASSQUIT (Tiaris fuliginosus) – A very nice pickup along the Blanchisseuse Rd. on the way to Morne Le Croix. RED-CROWNED ANT-TANAGER (Habia rubica) – A few sightings around AWNC, with the best being a very vociferous male on the morning walk on the next to last morning there. 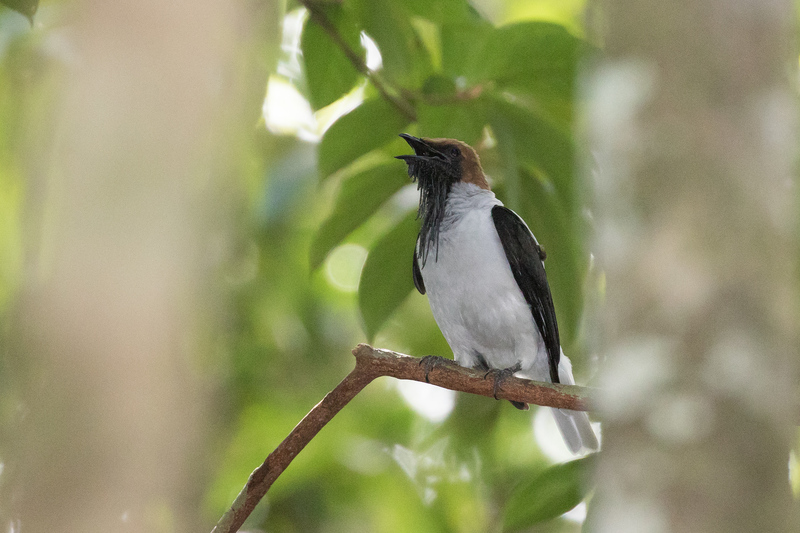 Bearded Bellbird is the logo of AWNC, and we regularly heard their resonant calls and songs ringing through the forests during any of the daylight hours in which we were on the grounds. Photo by guide Doug Gochfeld. RED-BREASTED MEADOWLARK (Sturnella militaris) – Our best views were at Aripo Livestock Station. CRESTED OROPENDOLA (Psarocolius decumanus) – Fascinating birds, in their social structure, their nesting colony behavior, and their intelligence. We were fortunate enough to experience them every day. YELLOW-RUMPED CACIQUE (Cacicus cela) – We got to see a nice breeding colony on the way to Nariva Swamp. EPAULET ORIOLE (MORICHE) (Icterus cayanensis chrysocephalus) – Just before dark a male came in and started calling and eventually singing at Waller Field, and eventually was briefly joined by another one. YELLOW ORIOLE (Icterus nigrogularis) – Seen at a couple of locations on our day along the west coast, with the best views probably coming at Brickfield. SHINY COWBIRD (Molothrus bonariensis) – Shockingly we only saw a couple of these widespread icterids, and only one which wasn't while we were driving. GIANT COWBIRD (Molothrus oryzivorus) – Great studies of a group of them foraging with some Southern Lapwings at Nariva. CARIB GRACKLE (Quiscalus lugubris) – Common and widespread in the lowlands. YELLOW-HOODED BLACKBIRD (Chrysomus icterocephalus) – A flock of over a hundred of these were in a field alongside the road on the way out to Waterloo, and some stuck around out in the open in some bamboo, allowing for scope views. TRINIDAD EUPHONIA (Euphonia trinitatis) – We had at least three of these in some mistletoe alongside the lower Blanchisseuse Rd. in the Arima Valley, right where David said they would be. VIOLACEOUS EUPHONIA (Euphonia violacea) – The abundant euphonia around the feeders at AWNC, we saw all variations of these as they attacked the fruit feeders and hung in the adjacent trees. They were also common in flame trees and other flowering and fruiting trees which hosted aggregations of feeding songbirds. COMMON WAXBILL (Estrilda astrild) – A flock of these introduced Estrildids were off on the side of the road on our way into the Hanuman Temple, but they atypically didn't stick around for us to walk back and look at once we disembarked. 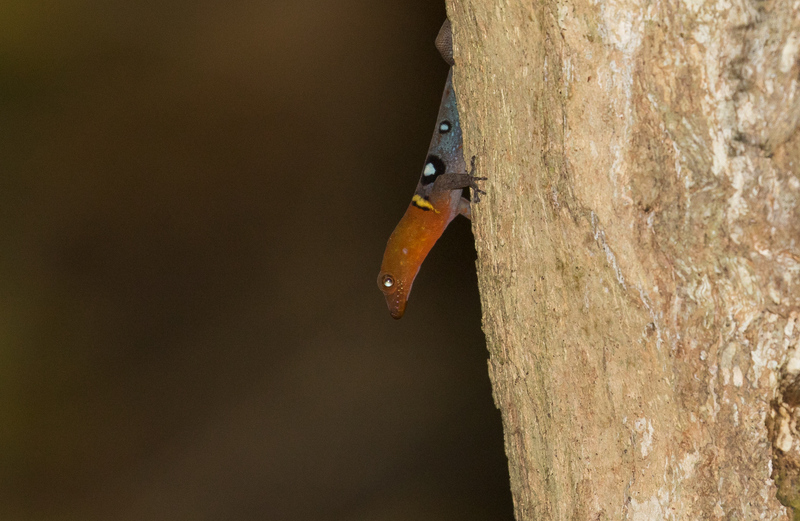 Ocellated Gecko is a Tobago specialty, and Zolani found us this beautiful example during our hike on Little Tobago. Photo by guide Doug Gochfeld. PALLAS'S LONG-TONGUED BAT (Glossophaga soricina) – Apparently this is the (only?) species that visits the hummingbird feeders at AWNC while it is dark out. I'm not sure if it's also the one coming to the fruit feeders, and the staff didn't seem to have an opinion on those either. GREATER WHITE-LINED BAT (Saccopteryx bilineata) – These were the larger and colder-toned "White-lined Sac-wings" which we saw hunting diurnally around some of the trails around the forest of the Northern Range, away from AWNC. MILLER'S LONG-TONGUED BAT (Glossophaga longirostris) – These were the bats lined up comically in one long line as they hung from the ceiling in the vacant guest house on Tobago. 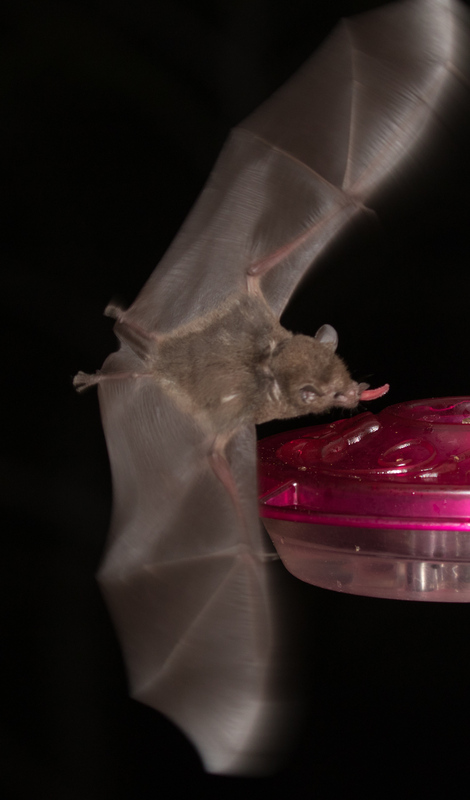 Pallas's Long-tongued Bats have one of the fastest metabolisms (perhaps the fastest) of any mammal, and so we got to see an endless stream of them availing themselves of the leftover sugar water in the AWNC feeders once dark fell and the daylight users went to roost. Photo by guide Doug Gochfeld. LESSER WHITE-LINED BAT (Saccopteryx leptura) – These were the brown "Lesser Sac-wings" which were diurnally hunting the trails around Asa Wright. This seemed to be the predominant species of Saccopteryx at Asa Wright, where we only identified one or two White-lined Sac-wings (with the help of Dave and the other local guides). SILKY ANTEATER (Cyclopes didactylus) – An adorable ball of fur wrapped up over some branches as it slept in the mangroves of Caroni. Aside from a mass of fur, we definitely saw at least one claw, the base of the head/neck, and of course that tail wound around one of the branches. RED-TAILED SQUIRREL (Sciurus granatensis) – We somehow completely missed this as a group on Trinidad, but then we caught up to great views of a close one in the Main Ridge forest on Tobago. RED-RUMPED AGOUTI (Dasyprocta agouti) – Daily around the feeders at AWNC, away from which the species tends to be very shy, as it is a very popular game species in the region. GREEN IGUANA (Iguana iguana) – A big and very green one near the parking lot at the Magdalena Grand. Nice seeing this species where it is native, for a change. OCELLATED GECKO (Sphaerodactylus argus) – A very cool small gecko, with a bright red-orange head and big circles (giving it its name) on the neck. This striking species is naturally a Tobago endemic, though it has been introduced to Cuba, Jamaica, and the Florida Keys, among other locations. GIANT AMEIVA (Ameiva ameiva) – A few of these variably pelaged medium-sized lizards scattered through our travels on both islands, including commonly around the buildings at AWNC. GOLDEN TEGU (Tupinambis teguixin) – A few hanging out around the AWNC feeders, though not as many as in former times, and also a couple around Tobago Plantations. TREE BOA (Corallus ruschenbergerii) – We got to see a hulking adult curled up in a mangrove tree on the boat ride at Caroni Swamp, the place where we most commonly find the species. However, we also had a surprise bonus sighting of a younger one much more awake and actively hunting in a stand of bamboo during our night drive at Waller Field. 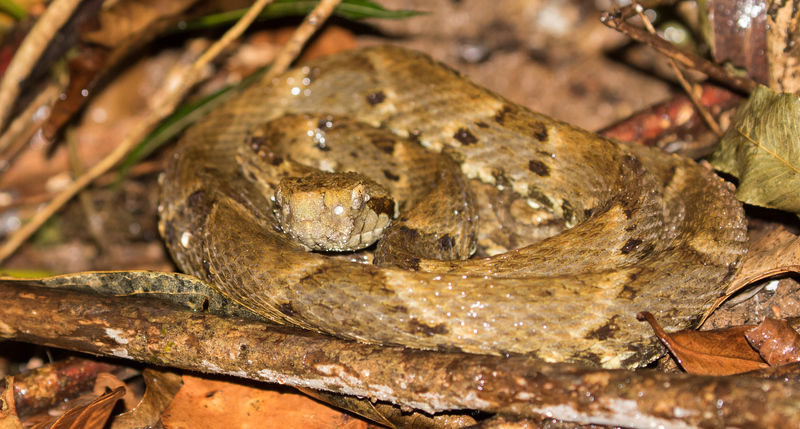 FER-DE-LANCE (Bothrops asper) – One of these was found by AWNC staff early on our first full day there, and those interested took a walk to go look for it after our Oilbird hike, where we had the great success of finding it before we got too close! SPECTACLED CAIMAN (Caiman crocodilus) – A drive-by view on the way to Caroni Swamp was quickly eclipsed the next day when we had very good views of a couple in close on a pond at Tobago Plantations. CANE TOAD (Rhinella marina) – One of these introduced and invasive toads was in the road at Waller Field. HAWKSBILL SEA TURTLE (Eretmochelys imbricata) – Awesome! Undoubtedly one of the coolest non-bird sightings of the tour was this Critically Endangered species taking some deep breaths at the surface just off the side of our boat as we motored out to Little Tobago Island, this even made one or two lists of best moments of the trip. 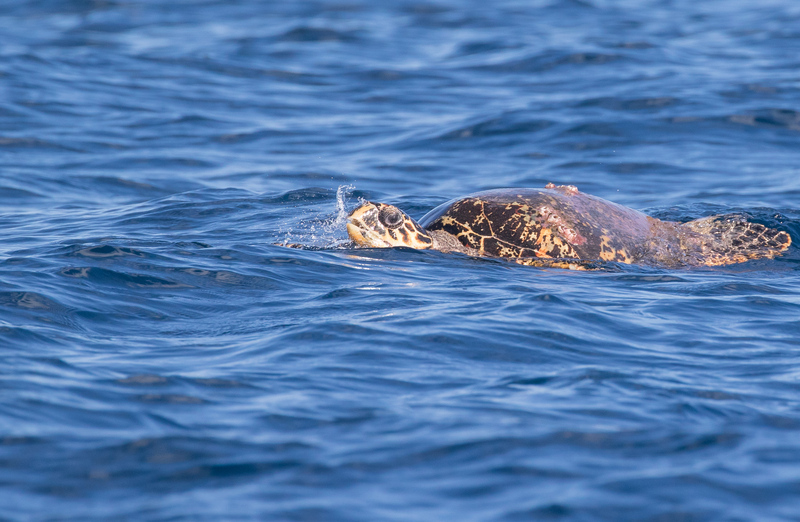 It wasn't all about birds on this tour, as this awesome Hawksbill Sea Turtle reminded us. Photo by guide Doug Gochfeld. TRINIDAD CHEVRON (Psalmopoeus cambridgei) – We saw this very neat looking (and large) endemic-to-Trinidad tarantula on several occasions at AWNC.